Albert Hiram Harrison was born on 5 January 1874 in Jamestown, Chautauqua County, New York. He married Louise F. Taylor, daughter of Thomas/Charles Taylor and Mary Gordon, circa 1897. Albert Hiram Harrison and Louise F. Taylor appeared in the US federal census of 1 June 1900 in Jamestown, Chautauqua County, New York, at Marvin Street. Other members of the household included Margaret Harrison and Mary Gordon. He was employed by the railroad as a conductor, according to the 1900 census. Albert Hiram Harrison and Louise F. Taylor appeared in the US federal census of 15 April 1910 in Jamestown, Chautauqua County, New York, at 313 West Seventh Street. Other members of the household included Margaret Harrison, Charles T. Harrison, Albert H. Harrison Jr. and Louise Helen Harrison. He was employed as a policeman, according to the 1910 census. Albert Hiram Harrison registered for the draft in Chautauqua County, New York, while living with his wife Louise at 610 Lafayeet Street in Jamestown, and employed by the city of Jamestown as a policeman. Albert Hiram Harrison and Louise F. Taylor appeared in the US federal census of 1 January 1920 in Jamestown, New York, at 313 West Seventh Street. Other members of the household included Margaret Harrison, Charles T. Harrison, Albert H. Harrison Jr. and Louise Helen Harrison. He was employed as a sergeant at the police station, according to the 1920 census. Albert Hiram Harrison and Louise F. Taylor appeared in the US federal census of 1 April 1930 in Jamestown, New York. Other members of the household included Louise Helen Harrison. He was employed by the city as a policeman, according to the 1930 census. Albert Hiram Harrison and Louise F. Taylor appeared in the US federal census of 1 April 1940 in Jamestown, New York, at 313 West Seventh Street. Other members of the household included Louise Helen Harrison. He was employed as a police lieutenant by the police department, according to the 1930 census. The following appeared on 31 August 1940 in the Jamestown Evening Journal: Lieutenand Albert H. Harrison of the Jamestown Police department and Mrs. Harrison were honored Friday evening on their 43d wedding anniversary at a surprise affair. A large number of friends and relatives visited their home at 313 West Seventh street. They have four children, Mrs. Margaret Erickson, Charles T. Harrison, and Miss Louise Helen Harrison of this city, and Albert H. Harrison, Jr., a chief petty officer of the United States navy stationed at San Diego, Cal. The affair was arranged by Mrs. Erickson and Mrs. Harrison. Albert Hiram Harrison became a widower at the 16 July 1946 death of his wife Louise F. Taylor. The following appeared on 16 July 1946 in the Jamestown Post-Journal: Mrs. Louise Taylor Harrison, 72, wife of Councilman and former Police Lieutenant Albert H. Harrison, died at the family home, 313 West Seventh Street, at 6 A. M. today, after an illness of seven mothers. She is also survived by four children, Mrs. Margaret Erickson, Charles T. Harrison and Miss Louise Harrison of this city and Lt. Commdr. Albert H. Harrison, Jr., United States Navy, now stationed at Orange, Tex., a brother, Charles Taylor of Hampton, Va; seven grandchildren, andone great grandchild. Her sister, Mrs. Elizabeth Whatford of this city, died on March 30 of this year, and another sister, Mrs. Ellen Ingraham of Niagara Falls, N. Y., died on the following day while en route to Jamestown to attend the former's funeral services. Mrs. Harrison was born in London, England, on March 26, 1874, daughter of Thomas and Mary Gordon Taylor, coming to the United States when a young girl. For many years she was active in the affairs of SS. Peter and Paul's Roman Catholic Church, its Rosary Society and Court St. Gertrude, Catholic Daughters of America. The remains are at the Boyd Funeral Home, funeral arrangements to be made later. Albert Hiram Harrison died on 10 October 1948 at age 74 in Jamestown, Chautauqua County, New York, at Jamestown General Hospital. He was interred at Holy Cross Cemetery, Jamestown, Chautauqua County, New York. The following appeared on 11 October 1948 in the Jamestown Post-Journal: Albert H. Harrison, 74, of 313 West Seventh Street, a former city councilman, who served for 35 years in the Police Department, died at 11:20 P. M. Sunday at Jamestown General Hospital. He is survived by two sons, Charles F. Harrison and Albert H. Harrison, Jr., a lieutenant commander in the United States Navy; two daughters, Mrs. Margaret Erickson and Miss Louise Harrison; a twin sister, Miss Cecelia Harrison, and a sister, Mrs. Leonard J. Drescher; seven grandchildren, and two great grandchildren, all of this city. One grandchild, Charles Harrison, is serving in the United States Army, stationed in New York. He was the last survivor of six brothers, the others being James, Cornelius, William H., George C. and John Harrison. Born here on Jan. 6, 1874, son of Mr. and Mrs. William H. Harrison, he spent his entire lifetime in Jamestown. 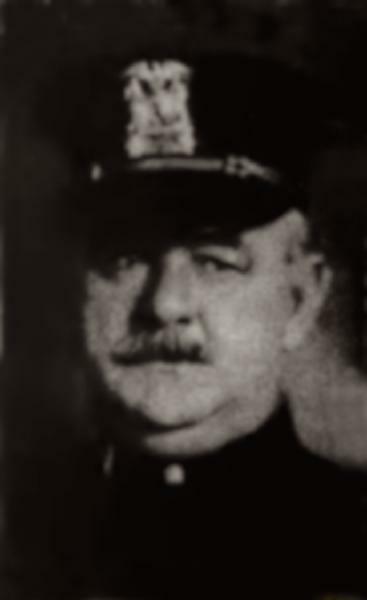 He was a pioneer employe of the old Jamestown, Chautauqua & Lake Erie Railraod, later entering the Jamestown Police Department and serving successfully as a patrolman, sergeant and lieutenant for 35 years up to the time of his retirement. For six years he had served as a councilman from the Second Ward, retiring last January. A member of SS. Peter & Paul's Roman Catholic Church, charter member of Jamestown Council, Knights of Columbus, he was alsoi a member of Samuel M. Porter Camp, United Spanish War Veterans, and Jamestown Lodge, P. P. O. Elks. He was serving as a private in Company E, 65th New York Volunteer Infantry, of Jamestown, at the outbreak of the Spanish-American War, and left for Camp Black with the company on May 1, 1898, serving throughout the war in the same unit at Camp Alger, Va. When the company left Jamestown for war service he was one of six brothers and cousins to receive farewell greetings from Patsy Moynihan, his grandfather, then in his nineties, the others being his brothers, Cornelius, William H. and George Harrison, all of whom resided in Jamestown up to the time of their deaths, and his cousins, Frank F. Moynihan, now residing in Detroit, and the late Thomas Mahoney. The most notable incident of Mr. Harrison's service in the Police Department occurred during the time he held the post of sergeant. In reponse to a call from Patrolman Eric Hartquist for help at the Winter Garden shortly after midnight on Nov. 14, 1921, he and Capt. Gust J. Stohl entered the theater and a gun battle with two thugs ensued. Harrison was shot in the breast bone, just above the heart, but he assisted Captain Stohl in capturing one of the thugs, John Nowak. The other thug, Chester Chase, was captured by Hartquist after another exchange of shots. Harrison hovered between life and death for several days. A little more than a year after this incident, Harrison, then a lieutenant, sounded the alarm through a police call box for the fire on Nov. 24, 1922 which completely destroyed the Warner Block on Main Street. During his younger years he was a well known athlete, especially as a baseball player, serving as catcher for some of the best known local teams. Funeral services will be held at SS. Peter & Paul's Church at 9 A. M. Wednesday, with interment in Holy Cross Cemetery. The remains are at the Boyd Funeral Home. The Police Department will attend in a body, also providing the bearers.